We are having unusually warm weather in Ohio. Today felt like spring, so Teresa and I took advantage of the warm weather and took at hike at Charleston Falls Preserve. I can’t wait for spring. They call this spring fever. On Valentine’s Day, we awoke to this soupy fog. It really was not bad for driving, but it sure looked cool. It reminded me of a trip to London, England a few years ago. I flew in on a very wet and cool evening, then took a train into the city. The fog was intense. This fog felt much the same way. When I was 18, I loved driving in fog. Over the years, I never lost that. It feels mysterious. Maybe I’m the only person on earth that feels this way, but I love a good fog. I took the larger photo above, and Teresa took the other two. Even with the rain and fog, we enjoyed our trip. The rock that makes up Old Man’s Cave, and what you see throughout Hocking Hills State Park is called Black Hand Standstone. I read that at some places the rock is over “200 feet thick and composed of almost pure quartz sand and pebbles. In some portions, it is dominated by white, rounded quartz pebbles and forms a conglomerate. Because of its thickness and resistance to erosion, the Black Hand forms shear cliffs and gorges.” (www.ohiohistorycentral.org) It’s impressive! The Hocking river runs down into the cave, and felt very cold. With the ice, I was seriously worried about going over the edge. There are places where the fall would be in excess of 100 feet. I recall stories of people going over the edge at the park, even in good weather, so I stayed away from the edges of the cliffs. Teresa was a little more daring. We both came home safe. This photo is from Old Man’s Cave in Hocking Hills State Park. 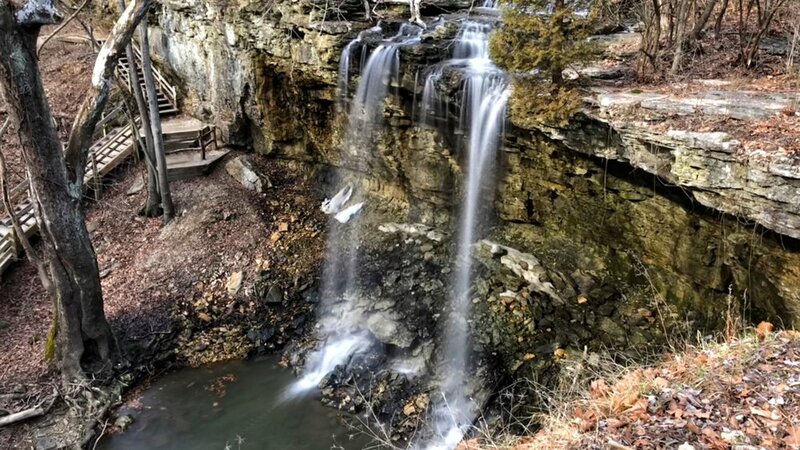 This park is one of Ohio’s most beautiful places to visit. That’s not snow ... it’s ice. The water was mostly frozen, and walking the trail was treacherous. We didn’t fall, but we were walking very slow.